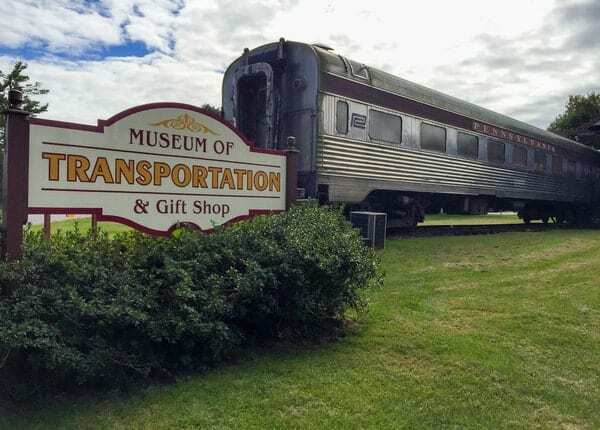 I love visiting museums that are born out of private collections, so I was excited when I had the chance to check out the Harlansburg Transportation Museum a few miles outside of New Castle, Pennsylvania. The museum is the product of Donald Barnes’ 30+ years of collecting. A retired pilot for Allegheny Airlines, Barnes began collecting pieces of transportation memorabilia without much of a purpose. His collection expanded until there was no more room left in his Pittsburgh home. Even his garage housed items, including a partially constructed biplane. 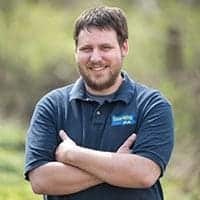 To expand his collection, Barnes and his family moved fifty miles out of Pittsburgh to a rural part of Lawrence County. Here, he built an airplane hangar and a dirt airstrip, in addition to space to house his growing collection. 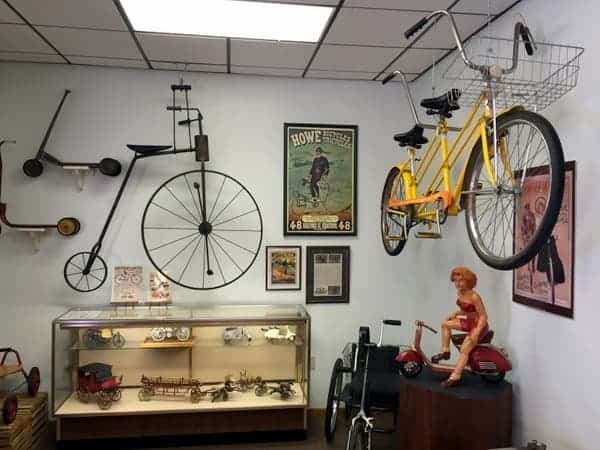 Within years, Barnes began work on a museum to showcase his amazing collection of transportation items, and the Harlansburg Transportation Museum was born. The Harlansburg Station Museum was designed to look like a train station with railcars sitting outside. The Harlansburg Transportation Museum is housed in a replica train station along Route 19 in eastern Lawrence County. The train station appearance isn’t relegated to just the building itself, but is completed with the four Pennsylvania railcars sitting along the replica train platform. The station was so realistically created that I initially assumed that it was an authentic station that had been repurposed. Inside the museum, there are two large rooms filled with transportation related memorabilia. 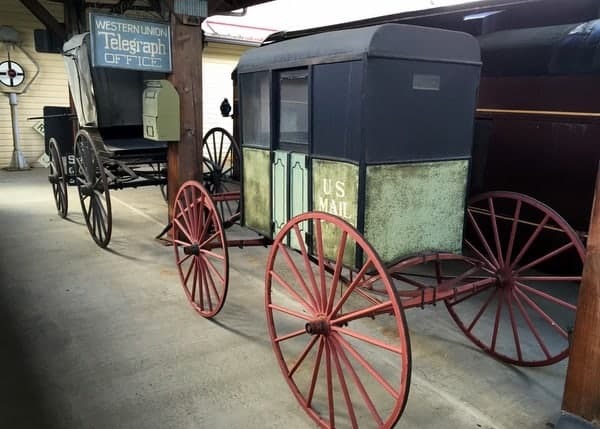 The first, which also serves as the museum’s ticket counter, features a large variety of antique wheeled transportation, including several old bicycles and a very large wheel from a Conestoga wagon. The first room of the museum contains a variety of wheeled transportation, including some old bicycles. The second room is the main museum space and features a wide variety of items, all somehow related to transportation. In the center of the room, several large display cases showcase toys ranging from cars to airplanes. Also sitting in the room is a very large rotating beacon. This light used to guide planes into Allegheny County Airport near Pittsburgh. Along the walls of the room are transportation displays, military artifacts, and even movie props. And while there were many other displays, a few stood out to me as being especially interesting. 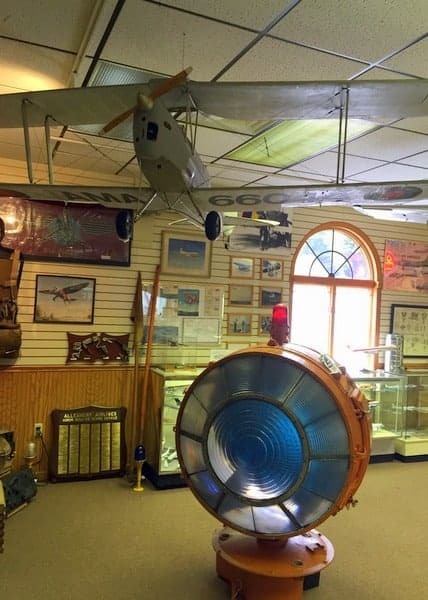 This airport beacon and large model airplane are part of the museum’s aviation collection. The first was a collection of wooden ships that were made by hand. These ships are models of actual ships that once plied the waters around Pittsburgh and are incredibly detailed. Since I’m sure these ships no long exist, these models give a great glimpse into river life in the region. Also of interest was the collection of items related to the early years of aviation. The museum had information about female pilots from the 1930s, and how they were able to break into a male occupation. There was also pictures of Bernie Cain, the first human to travel by airmail as a piece of cargo (something that evidently wasn’t that uncommon at one point). Lastly, I really enjoyed the collection of items related to some famous old ships. While many of these items were historical pieces, the prop life jacket from the set of “Titanic” was also interesting to see. Behind the station sit four refurbished Pennsylvania railroad train cars. On the station platform in the middle sit a variety of antique carriages and wagons, including a very cool US mail wagon. Two restored carriages sit on the platform of Harlansburg Station. The two railcars to the left of the platform still require significant interior refurbishment before they are opened to the public, but the two on the right have been completely remodeled and feature exhibits for visitors. The first car showcases many beautiful and rare artifacts from the Pennsylvania Railroad. If you’re interested in railroad history, this car has a bit of something for everyone. 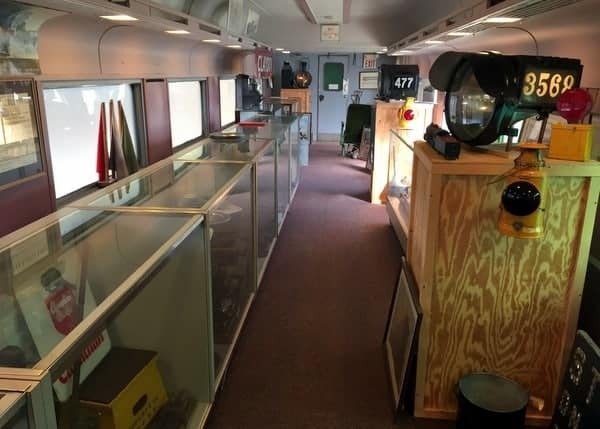 The display cases are filled with Pennsylvania Railroad silverware and dishes, old advertisements, and small electronics. On the walls are more electronics and advertisements, along with maps of the rail lines. As someone who loves trains, I really enjoyed the items in this car. The inside of the first railcar contains many items related to the Pennsylvania Railroad. The second railcar has a long, but narrow model railroad. While the confines of a railcar present some unique restrictions for the layout, it is very well done. I especially enjoyed the replica of the roundhouse as very few of those still exist in Pennsylvania. Overall, I enjoyed my visit to the Harlansburg Station Museum. 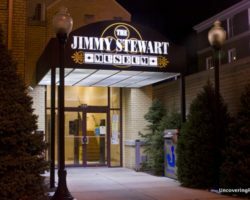 While the collection doesn’t focus on any one type of transportation, there are enough items in this relatively small museum to excite anyone that is interested in the history of transportation in America. 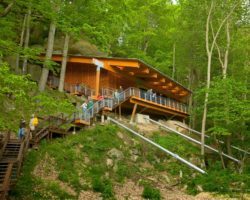 This museum is close enough to places like New Castle, McConnells Mill State Park, and Slippery Rock that a visit is definitely worthwhile. Note: My visit to the Harlansburg Station Museum was hosted by the museum. However, the opinions expressed are my own. 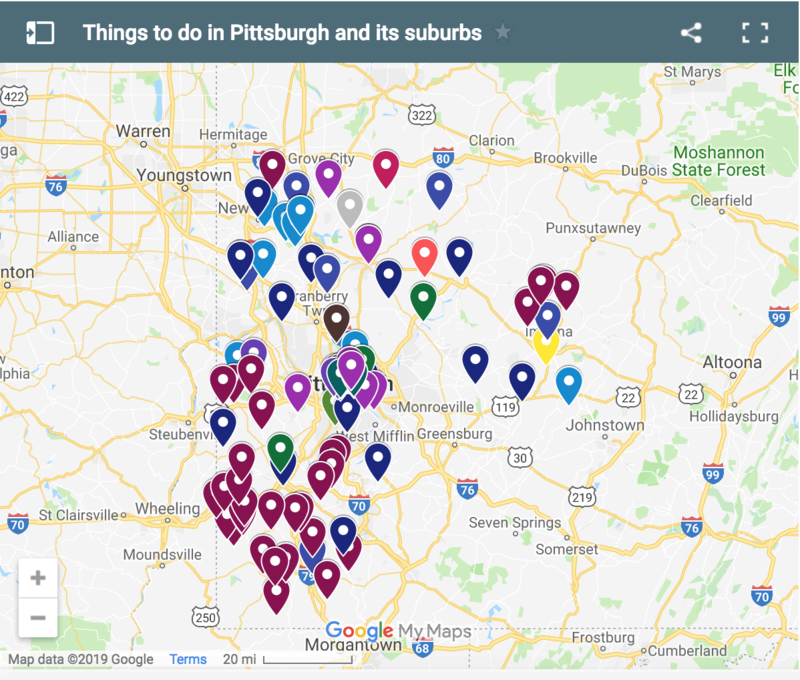 Want to visit other nearby museums? 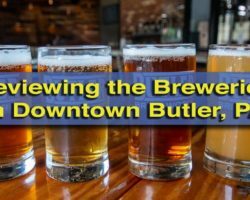 Check out the Air Heritage Museum, the Lawrence County Historical Society Museum, and Check’s Radio Museum.